How would you like a chance to win huge cash ? Enter the PCH Lotto Sweepstakes now through July 26, 2018 for your chance to win $250,000 cash prize. 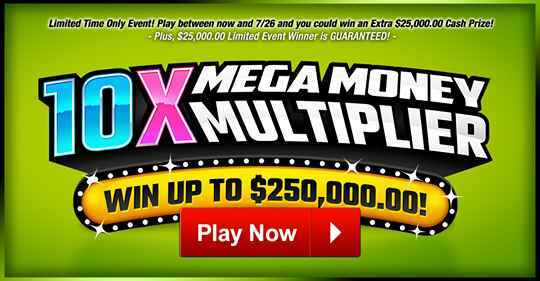 This is a limited time event only, So get ready for the Mega Money Multiplier from PCHlotto (“PCH Publishers Clearing House”) Go for 2, 4, 5, or even 10X the contest value for your chance to win up to $250,000 in cash. Play Now and Win Big.!! Who Can Enter: This sweepstakes is open only to legal residents of United States, the UK, and Canada (void in Quebec) who are eighteen (18) years age or older at the time they enter this sweepstakes. When To Enter: The PCH Lotto Sweepstakes entry begins at July 22, 2018 and ends at July 26, 2018. Who’s Sponsor: This PCH Lotto PowerPrize Sweepstakes is sponsored by Publishers Clearing House, 101 Winners Circle Jericho, NY 11753. All entries submitted for this PCHLotto game (Giveaway Nos. 11350, 11351, 11379, and 11380) by 11:59 P.M., ET the day of the draw will be eligible for that PCHLotto prize drawing. You will automatically be entered into these Giveways by selecting numbers for this PCHLotto game and submitting your entry (one entry per day). You will win a prize of $1,000,000.00 from Giveaway No. 11350 if the 8 numbers you selected match the 8 numbers randomly drawn. If you match the 8 of 8 numbers for Giveaway No. 11350 and match the PowerPrize Number randomly drawn, you will win a bonus prize amount from Giveaway No. 11351. Giveaway No. 11351 is a progressive bonus with the prize amount starting at $1,500,000.00 and increasing each time there is no user that has matched 8 of 8 numbers for Giveaway No. 11350 and also matched the PowerPrize Number, up to a maximum of $4,000,000.00. The amount you will be eligible to win will depend on the prize amount at the time of the drawing. You will win a prize of $500.00 from Giveaway No. 11379 if 7 of the 8 numbers you selected match 7 of the 8 numbers randomly drawn. If you match the 7 of 8 numbers for Giveaway No. 11379 and match the PowerPrize Number randomly drawn, you will win a bonus of $500.00 from Giveaway No. 11380. If there are multiple winners for any of the prizes from Giveaway Nos. 11350, 11351, 11379 and 11380, the prizes will be split equally among the individuals. Prize payout: Match 8 of 8 numbers for Giveaway No. 11350 and you will receive $25,000.00 a year for 29 years and a final payment of $275,000.00 in the 30th year. Match 8 of 8 numbers for Giveaway No. 11350 and match the PowerPrize Number and you will also receive 2.5% of the bonus total from Giveaway No. 11351 annually for 29 years and a final payment of 27.5% of the bonus total in the 30th year. Multiple winners (if any) will share the prize equally. Present value of Giveaway Nos. 11350 and 11351 will vary depending on interest rates and market conditions at the time of the award. All other prizes will be paid in full by check at time of award, unless otherwise noted. PCH expressly reserves the right, at its option, to award merchandise prizes in cash at the stated value.